Add some Mickey to your baby's gear with the Disney Mickey Baby Bundle. Each Sold Separately.The Mickey Bundle offers a black and white Mickey theme perfect for your little boy. Featuring a lightweight design for easy storage and travel. 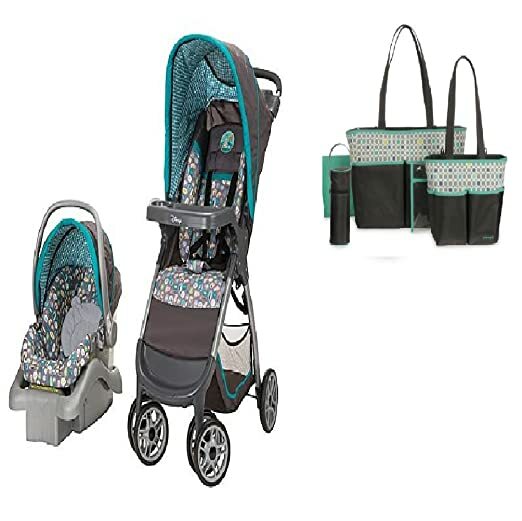 From the car to the sidewalk, this stroller and car seat travel system from Disney provides outstanding safety and mobility. The car seat offers side impact protection and infant head support, and can be quickly detached from its base and secured into the stroller. The substantial stroller has plenty of storage, and a one-hand fold system. 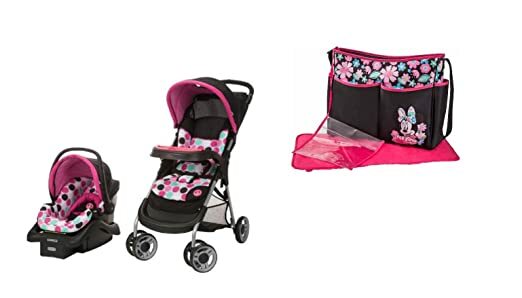 Parents who are looking for fun gear for their little ones love the Minnie Dot Lift & Stroll stroller and car seat. For a great value, you get a seat that includes a high quality stroller and car seat. Whether you are walking around town running errands, enjoying a little family stroll, or heading out on a road trip to visit relatives, you have everything that you need to keep your little one's content. The Lift & Stroll stroller and car seat features a smart stroller and a Light 'n Comfy car seat. With the QuickClick function, you can quickly and easily attach the car seat right to the stroller, adding flexibility to this versatile set. The car seat keeps babies safe and comfortable, thanks to the adjustable stay-in-car base and side impact protection. The stroller has features for both parents and children including covered cup holders, trays, an adjustable canopy, and spacious storage. Disney moms, make your baby's outing brighter with a character motif on your diaper bag. This colorblock tote looks sweet and stylish with a design on the front flap pocket and print. Spacious for your infant's essentials yet lightweight and easy to carry, this bag also fits a coordinating changing pad that keeps diaper changes clean and easy. Add style and convenience to baby's day out with this Disney Geo Pooh infant's stroller and car sear travel system featuring Disney's Winnie the Pooh. The smart stroller comes equipped with parent and snack trays, cup holders, and a storage compartment with headphone cord access for Mom and Dad. The infant car seat offers side impact protection and a stay-in-car base. Keep all of your baby's needs at hand with this infant's Winnie the Pooh diaper bag set from Disney. This convenient carryall features durable nylon construction and sports a multicolored leaf print, as well as an embroidered applique of Pooh bear on the flap. A generous five-pocket design allows ample space for bottles, toys, diapers, wipes and formula. In addition, this set comes with an attached see-through accessory bag and a fold-out foam changing pad. Add some magic to your walks with the Disney Baby Lift and Stroll Plus Travel System. The stroller lifts to fold with just one hand and a quick pull upward. It's lightweight and compact when folded, making it easy to store or take along for the ride. Featuring QuickClick, the infant seat attaches to the stroller in one quick step for a complete travel system. The car seat has Side Impact Protection and four harness heights for better fit and a safer ride as baby grows. Parents will also appreciate the light weight of the car seat, the lightest car seat available, making it much easier to move from the car to wherever they need to be. Your child will love the extra padding on the stroller that gives them an extra-comfortable ride. You'll love the handy parent tray with two cup holders and a storage tray for small items and the larger basket underneath for all that added gear kids bring along with them.